Welcome to the Practice ! We strive to make our lobby an inviting place. By scheduling plenty of time for each appointment, it is our goal to eliminate waiting. We don't want our lobby to turn into a waiting room. Your appointments start and end here. 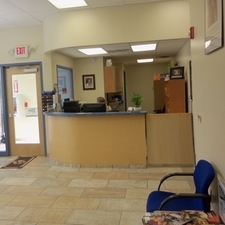 You will check in with our receptionist, schedule any follow up appointments, and check out here. 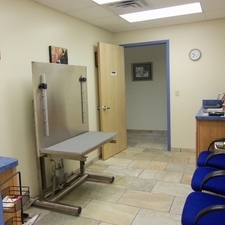 This is our largest exam room. 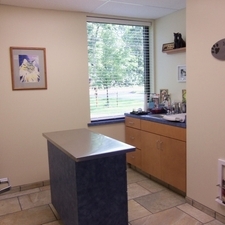 It is great for multi-pet visits or if there are a number of people accompanying the patient. 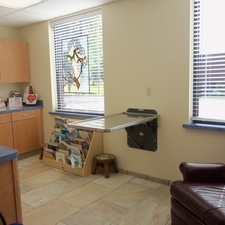 We like to use this room for larger pets that need to be examined on the floor. There is also a table that folds down from the wall making it a great multipurpose exam room. This room is set up especially with our feline friends in mind. Cats can get very stressed out by the smallest of changes. We use a smaller room with them and have a Feliway diffuser in use which disperses a pheromone that naturally makes most cats more relaxed. A counter top scale which is easy and comfortable for them to use is in this room as well. A special place to examine our exotic patients. 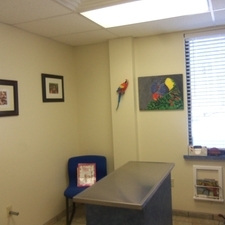 In this room, with smaller instruments and a tiny scale, our doctors enjoy having the additional knowledge and expertise that is necessary to examine, diagnose and treat exotics. Even the artwork on the walls represents these special patients. This exam room is equipped with a lift table. This enables us to adjust the height of the table as needed for exams. The room is large enough for several people and the open environment is one of the reasons why dogs are less fearful here. 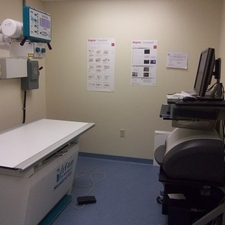 This is where our digital radiographs are performed. The images are captured in seconds making it safer and less stressful for our patients. 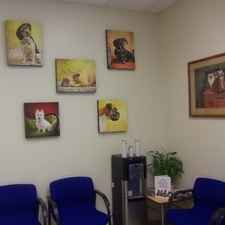 Our digital equipment allows us to burn a CD or email images as necessary and all images are permanently saved to each pet's individual medical record. 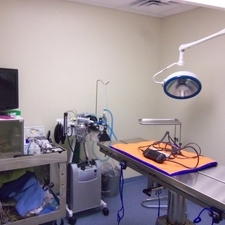 Our state of the art surgery suite includes everything necessary to complete procedures from spays and neuters to mass removals.